Sponsored by the International Amateur Radio Union (IARU), the Worked-All-Continents award is issued for working and confirming all six continents (North America, South America, Oceania, Asia, Europe and Africa) on a variety of different bands and modes. 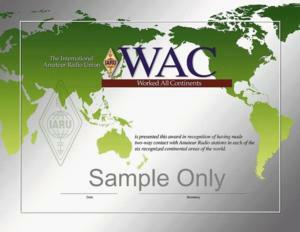 The WIA has been approved to issue this award to VK applicants on behalf of the IARU. Qualification for the WAC award is based on an examination by the International Secretariat, or a member-society, of the IARU of QSL cards that the applicant has received from other amateur stations in each of the six continental areas of the world. All contacts must be made from the same country or separate territory within the same continental area of the world. All QSL cards (Photocopies , eQSLs, LOTW and scans cannot be accepted for this award.) must show the mode and/or band for any endorsement applied for. Contacts made on 10/18/24 MHz or via satellites are void for the 5-band certificate and 6-band endorsement. All contacts for the QRP endorsement must be made on or after January 1, 1985 while running a maximum power of 5 watts output or 10 watts input. QSL cards must clearly indicate QRP. The following information should be helpful in determining the continental area of a station located adjacent to a continental boundary. North America includes Greenland (OX) and Panama (HP). South America includes Trinidad & Tobago (9Y), Aruba (P4), Curacao & Bonaire (PJ2-4) and Easter Island (CE0). Oceania includes Minami Torishima (JD1), Philippines (DU), Eastern Malaysia (9M6-8) and Indonesia (YB). Asia includes Ogasawara Islands (JD1), Maldives (8Q), Socotra Island (7O), Abu Ail Island (J2/A), Cyprus (5B, ZC4), Eastern Turkey (TA2-9) and Georgia (4L). Europe includes the fourth and sixth call areas of Russia (R1-6), Istanbul (TA1), all Italian islands (I) and Azores (CU). Africa includes Ceuta & Melilla (EA9), Madeira (CT3), Gan Island (8Q), French Austral Territory (FT) and Heard Island (VK0). Sufficient return postage for the cards, in the form of a self-addressed stamped envelope is also required.